I am thrilled to be participating in another giveaway hop with the Green Moms Network! There are always great products that I learn about through these hops! I hope you enjoy them as well! I am excited to announce that I have not one, but two great sponsors for helping you “fall into green” this year! Welcome to the Fall Into Green Giveaway Hop, hosted by Happy Mothering and Happy Green Mama through the Green Moms Network. Each participating blog is hosting a green or eco-friendly giveaway worth at least $25. You can find the list of participating blogs at the bottom of my post. 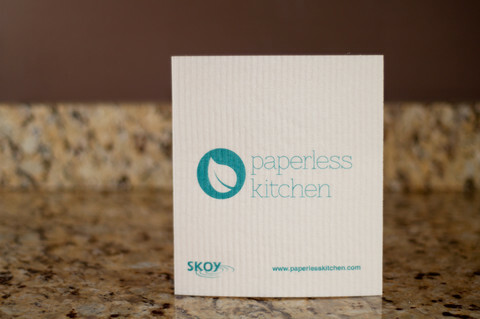 Thank you to Sachin from Paperless Kitchen for sponsoring this giveaway hop with me! Their Skoy Cloth is absolutely wonderful! I was so excited to be able to review these before this giveaway went live! They work amazing as wash cloths, dusting cloths, cleaning cloths, and so much more! Be sure to stop by and read my full review here. Paperless Kitchen is giving away a set of 15 Skoy Cloths to one of my readers! Be sure and enter to win below! My second sponsor is Holly, she is a representative for Young Living. They have so many products that will help you “fall into green”. From essential oils, to hair care and dental care! We use their toothpaste in our home, both the kids and the adults type and we love them! Stop by and check out the Grand Prize Giveaway!! We also have a fabulous Grand Prize for this giveaway hop, sponsored by Maggie Bags. Two lucky winners will each receive The Tote of Many Colors in The Fall of Leaves or Camo – Maggie Bags’ most eco-friendly bag! Made of super durable recycled seat belt webbing, this roomy tote will hold everything you need and want, even that extra pair of shoes! Hey, looks like I won this Giveaway, but no one has contacted me about it. Someone saw Kim C. and thought it was me so they told me about it. I’m so sorry! I sent one email, but it got kicked back! I’ve been having issues with gmail this week, I apologize! I emailed you again, please let me know if you don’t receive it! Thanks! I love their Organic Snack bags-Ecoditty snack bag. I’d like to try the pet shampoo. Ruth Hill recently posted..Soda Stream Giveaway (ends 10/30) U.S. Lavender mint daily shampoo sounds good!! Gena recently posted..National Coffee Day FLASH GIVEAWAY! i would like to try the toothpaste! I love the Twist Natural Kit. I would love to try the Eco-Ditty Color your own organic snack bags from paperless kitchen! e-carcare cleaning kit…could really use this. I would like to try the e cloth cleaning cloth. The kids toothpaste looks great. I’d love to try the ecloths. Lavender bath and body gel! The Cleansing Trio Kit looks good. I really like the mop! I like the snack bags! I’d really like to invest in some! I’d like to try the lavendar bath and shower gel. I like the reusable bamboo towel. I’d love the paper towels 5 day supply. I’d like to try the Sandalwood Moisture Cream – 4 oz. I would love some essential oils! Maybe lavender and peppermint! I’d like to try the ECODITTY SANDWICH & SNACK BAG – IN EYES OF THE WORLD. I want the Ecoditty sandwich and snack bag. Eco Ditty Color Your Own Organic Snack Pouch. I’d love to try the Essence of the Season kit – it sounds wonderful! I would love to try the Young Living Oral Hygiene Family Package! Non-paper paper towels for sure! The e-cloth washing up pad! I would like to try the KidScents Tender Tush – 2 oz. I would like to try out the PeopleTowels Family Pack. I love the e-cloth, you can never have enough great kitchen towels! I’d like to try their e-cloth washing up pad. I would like to try their deodorant. I would love to try the eat clean wipes! I would love the Ecoditty Snack Ditty Color Your Own Organic Snack Bag! I’d like to try the e-cloth laundry bag. I like the e-Cloth Starter Pack – 5pk! I’m loving the E-CLOTH PERSONAL ELECTRONICS CLEANING CLOTHS 2 CT.